There's nothing more that has gotten me so excited about sewing than knowing I can actually wear the clothes that I've made. When I saw this video tutorial on CreativeBug.com for the Wanderlust Tee I just knew it would fit great into my daily wardrobe. Plus this was a great opportunity to practice sewing more with knits and a serger, just like I did with the muscle tank. I love this t-shirt so much that I made three of them! Two of the tees are a solid color and cropped while the third one is striped and I made this one a little longer too. 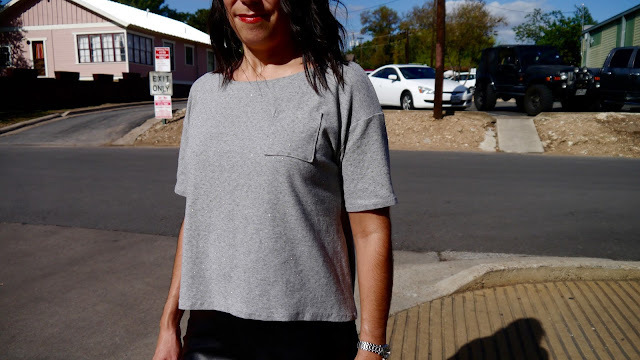 The gray tee was my first attempt at the shirt. I found this knit fabric at Joann's. It's a heather gray with tiny dots of gold glitter. This will probably be the last time I work with glittery fabric as it gets glitter everywhere whenever I wear it. Anyway I paired this tee with faux leather leggings and leopard sneaks for a casual/edgy look. Can you see some sparkle? The next tee I made was with a mustard yellow double knit fabric. I've been seeing this color a lot on fashion blogs so I had to give it a try. 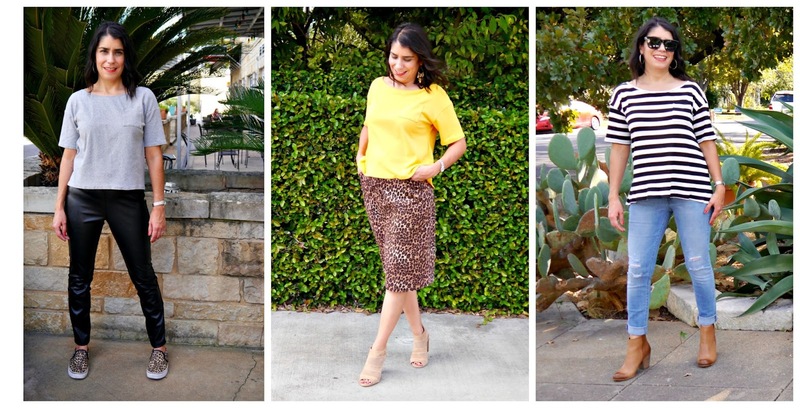 Plus I love yellow and bright colors go well with my skin tone. 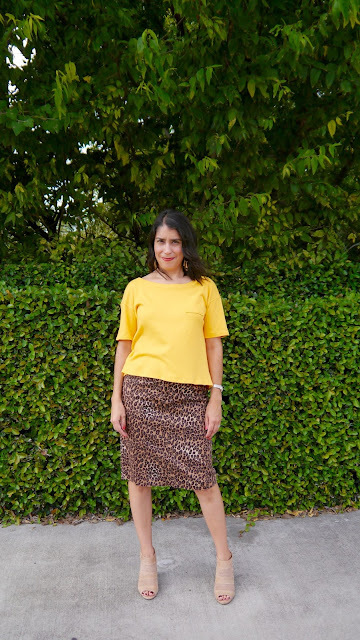 I paired the tee with a leopard print skirt that I picked up at the thrift store for $6. Cute for a date night or a night out with friends. And finally I decided to do a striped tee because it's classic. Plus here was my chance to practice lining up stripes for a sewing project. It wasn't too bad, just lots of double and triple checking. And on the Wanderlust Tee video tutorial, the instructor gave some great tips for this. 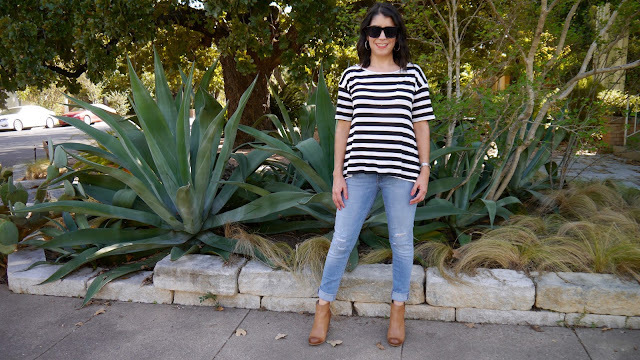 Here I paired the tee with distressed jeans and brown booties. I love this casual "momiform" look.